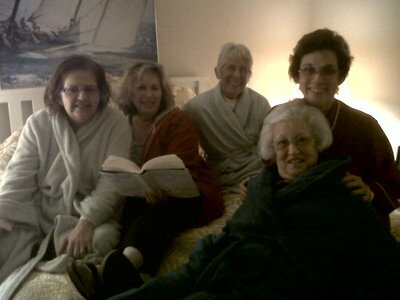 KI/SZ Book Club of Sister (and PJ) Princesses! Well, this was a first. 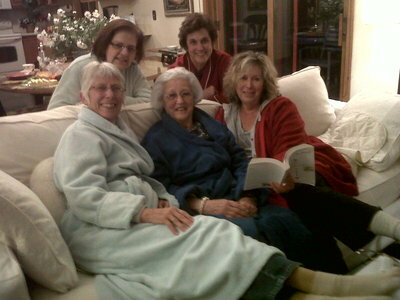 These two book clubs in Lansing, MI had already met to discuss QUEEN OF THE ROAD, but I couldn't call in that night. So, several of the ladies met again the very next night when I could. Talk about gluttons for punishment. Turned out to be quite an unusually adventurous group: Several RVers (my people aren't really known for hitting the road - hitting the desert, yes. Road? In an RV? Not so much), and even a woman, Judith, who sailed on Lake Michigan for years. Apparently, her husband had quite a bit in common with me: he wasn't, shall we say, the best passenger. I especially loved one of their takeaways from the book: Differences are something to appreciate rather than overcome to stay together. I couldn't (and didn't) say it better myself. Thanks for doubling down on your Queen, ladies! This page contains a single entry from the blog posted on May 16, 2010 2:29 PM. The previous post in this blog was Book Bags, Bells and Virgins, All With Finer Things to Do Tuesdays on the Lake. The next post in this blog is Bridgeville, Delaware Book Club.